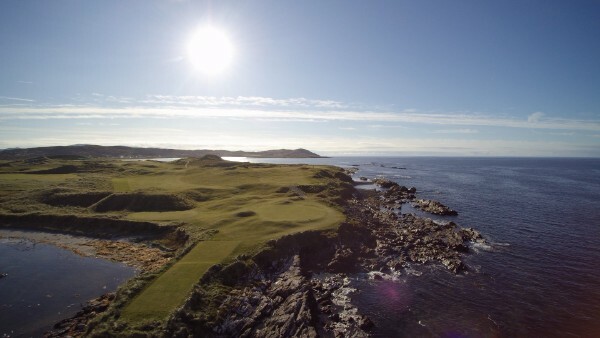 The best 18 golf holes on the Wild Atlantic Way ? The Wild Atlantic Way is a tourism trail on the West Coast of Ireland. The stunning 2,500km of coastline offers breathtaking scenery, invigorating sea swells, gastronomic gems and a warm welcoming atmosphere. It is also home to some of the greatest golf courses on the planet. Need a bucket list of great golf holes to play as you venture along the Wild Atlantic Way? Why not play our choice of the best 18 holes on the Wild Atlantic Way. The holes are played in the correct order they appear on the courses. The ‘course’ is a par 72 with four par 3’s and four par 5’s. Try out our front 9 for starters and let us know your feedback ..
Trump International Golf Links .. Par 5 .. Doonbeg is without doubt the best opening hole on the Wild Atlantic Way. An elevated tee has you staring down a dune lined hole to a green in the distance. The towering dunes create a truly magical amphitheater effect around the putting surface. Take time to admire the Atlantic Ocean which roars to your left. Globally recognised as a beauty. Portsalon Golf Club .. Par 4 .. The second hole in Portsalon is an absolute classic with long carries and stunning views. An elevated tee has you driving across a beach and river. Careful positioning is required as your second shot also requires you to carry the same river. Consistently voted the best second hole in Ireland. Tralee Golf Club .. Par 3 .. The back 9 is Tralee is often heralded as the best in the country. However there are also some great holes on the opening 9. The 3rd at Tralee is our choice for our Wild Atlantic Way list. The green sits delightfully on top of the rocks in front of the round tower. The scenery beyond is stunning. Old Head Golf Links .. Par 4 .. Of all the courses on the Wild Atlantic Way, the Old Head undoubtedly has the biggest ‘wow’ factor. The views will simply blow your mind. The ‘Razor’s Edge’ 4th hole is a classic. Playing along the cliff edge towards the lighthouse in the distance. Absolutely exhilarating and recognised the world over. Ballyliffin Golf Club Glashedy .. Par 3 .. Ballyliffin boasts two of the best courses in the country … The Old Course and Glashedy ( host of the 2018 Irish Open ). The stunning 5th on Glashedy makes our list. This hits straight out towards the sea with Glashedy Rock in the background. The green is slightly below , which enhances the views even further. Lahinch Golf Club .. Par 4 .. Recently celebrated it’s 125th birthday and host to the 2019 Irish Open, Lahinch Golf Course is a must play for all serious golfers. The thrilling 6th would mount a serious challenge for the best hole in Ireland. Surrounded by dunes, a blindish drive sets up a tough second shot towards the Atlantic Ocean. Watch out for the hollow!! Dooks Golf Club .. Par 4 .. Take your camera … the walk from the first green to the second tee opens up some of the most stunning scenery on the island. The long 7th hole is a classic links hole requiring a careful drive through a narrow channel of punishing dunes. This aerial view of the course is a taster of what you will experience at Dooks. Donegal Golf Club .. Par 5 .. Donegal Golf Club sits on the Murvagh peninsula and it is a links masterpiece. Playing over 7,000 yards with five par 5’s … the 8th is the pick of the bunch. This hole has everything … dunes and sea views to the right, a tilting fairway, a hollow, a drop , rough in front of the green and a bunker. Narin & Portnoo Golf Club .. Par 4 .. There is a stretch of holes from 7 to 15 which would rival any in the country for sheer quality and breathtaking views. The 9th hole is a gem. A long par 4 with the sea to your right which will test any golfer. Unlikely that you will get closer to the sea on any course on the Wild Atlantic Way. See image above. 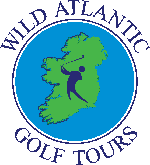 Wild Atlantic Golf Tours have designed ‘ The Collection Tours’ which focus specifically on our choice of the best 18 holes on the WAW. For further information on tours and how to include these courses in your golfing itinerary, please contact info@wagt.ie or visit our website for suggested golf trips at www.WildAtlanticGolfTours.com . The 2019 Dubai Duty Free Irish Open will be played at Lahinch Golf Club from July 4-7, 2019, the European Tour recently announced. The former Ryder Cup captain Paul McGinley will host the event which will see some of the world’s greatest players return to the Wild Atlantic Way. 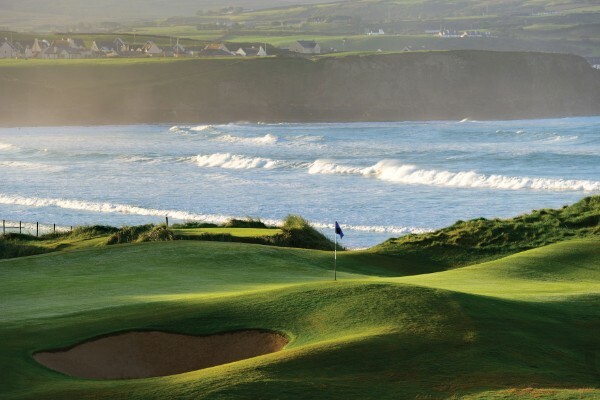 Lahinch Golf Club recently celebrated it’s 125th anniversary and the Old Links course is widely regarded as one of the best golf courses in the world. Lahinch is situated in County Clare on the West Coast of Ireland, less than an hour from Shannon International Airport. This year’s Irish Open takes place at The Glashedy course at Ballyliffin in County Donegal, yet another great golf course on the Wild Atlantic Way. The Wild Atlantic Way in Ireland is the world’s longest defined coastal touring route and is home to some of the greatest golf courses on the planet. The Wild Atlantic Way alone is blessed with over 40 golf courses , a combination of world famous links classics and hidden gems .. not to mention beautiful parkland courses. As you travel north from the Old Head in Kinsale to Ballyliffin in Donegal, you will encounter some of the greatest golf courses in the world. Links courses such as Lahinch, Ballybunion, Tralee, Waterville, County Sligo and Enniscrone regularly feature on the world top golf course listings. Wild Atlantic Golf Tours have a number of tours focused specifically on the WAW. We also include a tour which showcases some of the golf courses on the West Coast which have had the honour of hosting the Irish Open. For further information on tours and how to include these courses in your golfing itinerary, please contact info@wagt.ie or visit our website for suggested golf trips at www.WildAtlanticGolfTours.com .